Text: Once in a while a travelling cinematograph outfit roams through the provinces, and then for a tariff of twenty-five cents Mexican we throng the little theatre night after night. I remember once a company of “barn-stormers” from Australia were stranded in Iloilo. 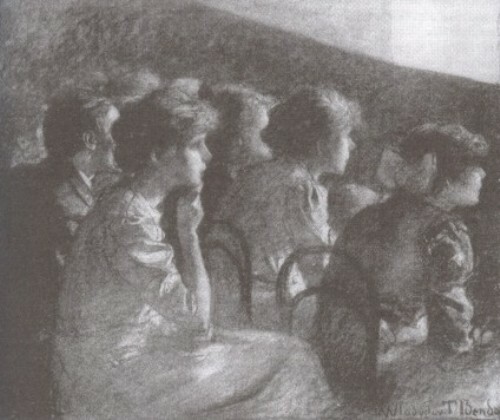 They had a moving picture outfit, and a young lady attired in a pink costume de ballet stood plaintively at one side and sang, plaintively and very nasally, a long account of the courting of some youthful Georgia couple. The lovers embraced each other tenderly (as per view) in an interior that had a “throw” over every picture corner, table, and chair back. Some huge American soldier down in the pit said, “That’s the real thing; no doubt about it,” but whether his words had reference to the love-making or the room we could not tell. The song went on, the lovers married and went North; but after a while the bride grew heartsick for the old home, so “We journeyed South a spell.” With this line the moving picture flung at us, head on, a great passenger locomotive and its trailing cars. To the right there were a country road, meadows, some distant hills, a stake and rider fence, and a farmhouse. The scene was homely, simple, typically American, and rustic, and it sent every drop of loyal American blood tingling. The tears rushed to my eyes, and I couldn’t forbear joining in the roar of approbation that went up from the American contingent. An Englishman who was with our party insisted that I opened my arms a yard and a half to give strength to my applause. I said I didn’t regret it. We poor expatriated wanderers had been drifting about for months with no other emotion than homesickness, but we had a lively one then. The Filipino audience at first sat amazed at the outburst; but their sympathies are quick and keen, and in an instant they realized what it meant to the exiles, and the wave of feeling swept into them too. The young lady in the pink costume grew perceptibly exalted, and in the effort to be more pathetic achieved a degree of nasal intonation which, combined with her Australian accent, made her unique. Comment: Mary Helen Fee was an American working for the Education Department of the Philippine Islands, which at this time (1910) were under United States administration following the Philippine-American War of 1899-1902. The Australian troupe sounds not unlike the Corrick family of entertainers, who are known to have visited South East Asian locations at this time. This entry was posted in 1900s, Philippines, Travel writing and tagged Audiences, Cine-variety, Iloilo, Mary Helen Fee, Travelling shows. Bookmark the permalink.